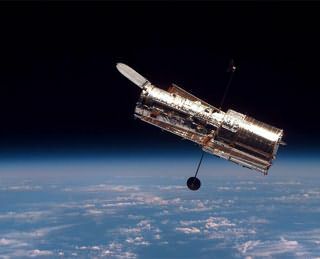 Nearly three years after deciding to abandon the Hubble Space Telescope, NASA reconsiders and announces a new servicing mission to the repair and enhance the Telescope. This Servicing Mission, the fifth, will install new instruments, gyros, batteries and other devices crucial for the telescope’s continued operation through 2013. The two new instruments, the Wide Field Camera 3 and the Cosmic Origins Spectrograph, have already been built at a cost of $200 million. A description of what can be done by these new instruments is available here. My blog has received the best stamp of approval it could, in my eyes: it's now banned in China. I can't take sole credit for this, unfortunately; it appears that all Blogger blogs are now inaccesable via a Chinese internet connection, since contacts of mine in other parts of China are also unable to access them. So much for our advice that because Google cut a deal with the China, and Blogger is powered by Google, Blogger would be a good choice. California Republican Duncan Hunter, chairman of the House Armed Services Committee, is the newest 2008 presidential candidate. Hunter's surprise candidacy brings the total number of potential 2008 presidential candidates back to 27. Former Virginia governor Mark Warner's departure from the race left 13 potential Democratic 2008 presidential candidates. This is the largest number of potential presidential candidates I recall. So many are running because 2008 will be the first presidential election since 1952 without a sitting president or vice president on the ballot. Is Al Qaeda Planning A Pre-Election Surprise? Newsweek wonders if Osama & Co. will release a message before Election Day. Al Qaeda has lately released tapes at a rate of two or three per month. This month, the evil doers are one or two short. Intel experts believe Al Qaeda wants to be "relevant" to the U.S. political process. That could be accomplished with the release of a bin Laden tape, as bin Laden did just before the 2004 presidential vote, or by some more dastardly action. A new poll finds twelve-term Republican Representative Nancy Johnson slightly behind Democratic challenger Chris Murphy, 46 to 42 percent. The four point margin, is within the poll's "3.6" percent margin of error. Johnson enjoys strong support among Republican voters, 83 percent to 16 percent, while Murphy leads among Democrats, 77 percent to 16 percent. The key is held by the 45 percent of the voters in Connecticut's 5th District that are not registered as either Democrats or Republicans. According to the Associated Press this block of voters is breaking for Murphy, 45 to 36 percent. The poll was conducted by UConn's Center for Survey Research and Analysis between October 24 and 28, just before first lady Laura Bush, visited Connecticut to boost Johnson's campaign. Simmons leads Courtney 46 to 44 percent. Shays is tied with Farrell, at 43 percent. The Hartford Courant suggests the results reflect an anti-incumbent mood sweeping the country due to disenchantment with the war in Iraq. That analysis is wrong. If Connecticut voters are disenchanted with the war, why is the Democratic anti-war poster boy, Ned Lamont, trailing Senator Lieberman by nearly 20 points? If You Were Concerned About Electronic Voting Before . . . . In return, the government agency was given a 28 percent stake in the smaller company and a seat on its board, which was occupied by a senior government official who had previously advised Mr. Chávez on elections technology. Smartmatic then bought the much larger and more established Sequoia Voting Systems, which now has voting equipment installed in 17 states and the District of Columbia. The investigation is trying to determine whether the leftist Venezuelan government of President Hugo Chávez has any control or influence over the firm’s operations. The Times reports both Smartmatic and the Venezuelan government strongly deny that the Chávez’s regime has any role in Smartmatic. Is it not bad enough that the nation is in the process of implementing a voting system reliant upon machines that are demonstrably vulnerable to manipulation? Now we must also worry that a foreign nation, one with a leader hell bent on joining the axis of evil, may control a U.S. manufacturer of these problematical devices. We must step back and think about how ensure absolute confidence in the results of elections. Bush v Gore made that more than abundantly clear. Electronic voting systems are still not yet ready for prime time.